It’s clear. The language is free of jargon and uses metaphors that aid understanding. It’s accurate. The science comes from a body of knowledge, not just the latest study. It’s relevant. It shows how scientific research connects to current issues. It’s credible. It gives people enough information and explanation to trust research results. It overcomes existing preconceptions. It can be difficult for people to accept the science if the data conflicts with their beliefs. The video Executive Function: Skills for Life and Learning uses an empirically-tested metaphor about air traffic control to explain how executive function skills help us focus and process information. Draw coherent conclusions from a wide body of research. The first step involves analyzing existing research from a range of disciplines and identifying solid, widely accepted concepts. This is done primarily by members of the National Scientific Council on the Developing Child and the National Forum on Early Childhood Policy and Programs. These groups engage in vigorous peer debate of their own knowledge and that of other leading researchers in order to arrive at synthesis that best represent a firm foundation of current expert knowledge. Translate the knowledge. Next, we consult with our partners at the FrameWorks Institute, who conduct communications research on the topic of interest to identify and bridge important gaps in understanding between the public and scientists. With help from FrameWorks, we develop language that can fill those gaps in understanding by communicating the science of early childhood in a way that has been scientifically tested to inform public discourse in a credible and constructive manner, leading to increased understanding of child development that can inform decisions about policy and practice change. This short video highlights some of the many communications tools and products produced by the Center. Communicate the translated science using a variety of media forms and formats. We try to reach our target audiences in new ways that capture a sense of innovation, tap into different learning styles, and that both utilize the science of learning and take advantage of new technology. FrameWorks is a nonprofit, nonpartisan think tank devoted to framing public issues. Since 1999, FrameWorks has been investigating how Americans think about complex social issues—from child and adolescent development to global warming and race—and how scientists, policy experts, and non-governmental organizations can do a better job of engaging the public in effective solutions. Its work is based on Strategic Frame Analysis™, an empirical, multi-method, multi-disciplinary approach to communications research. FrameWorks designs, conducts, publishes, explains, and applies communications research to prepare nonprofit organizations to expand their constituency base, build public will, and further public understanding. 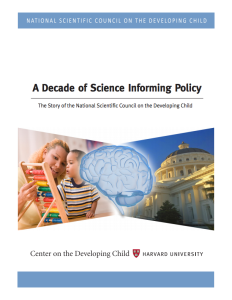 This retrospective report tells the story of how the National Scientific Council on the Developing Child came to be, its enduring partnership with the Center and FrameWorks Institute, what its impact has been, how its members work, and why the Council has made a difference.